New book, some rubbing wear to cover. "Keep off the skyline" was Ron Cashman's watchword in wartime Korea when a silhouette on the horizon invariably meant sudden death. It helped to keep him alive in confronting a vigilant and dangerous enemy for almost two years of armed conflict. And he has applied the same phrase ever since, through another fifty turbulent years. 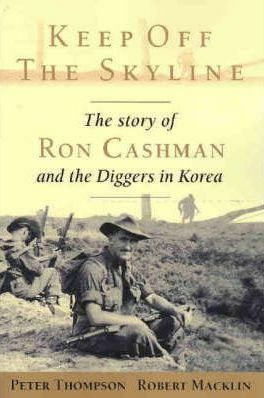 The Korean War has been central to Ron Cashman's life and it is the central theme of the book. The Korean War is ritually referred to in the Australian media as "The Forgotten War," yet it was never well enough known to be forgotten. How many Australians have ever been familiar with the Kapyong Valley, Little Gibraltar, Maryang San or The Hook? Very few, we believe. These were scenes of Australian heroism and Australian sacrifice that deserve their place in the public mind among the easily recognisable battle grounds of the two World Wars. It is by any measure a fascinating tale of war and post-war chaos; a compelling narrative of frontline exposure to an almost indestructible enemy and a horrifying descent into psychological terror. It is the story of a soldier who joined B Company as a rookie in the middle of savage firefight; who was wounded in action three times; who killed men in hand-to-hand combat; and who, in a brief interlude between long periods of barbaric trench warfare, met and fell in love with the woman who would see him through not only the armed conflict, but its unexpected aftermath. This item was added to our catalog on Friday 31 May, 2013.